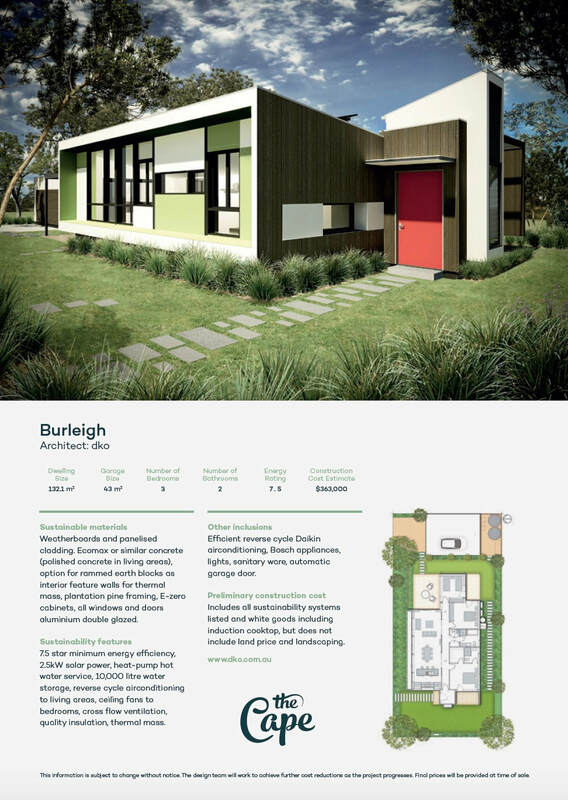 Sustainable materials: Weatherboards and panelised cladding. Ecomax or similar concrete (polished concrete in living areas), option for rammed earth blocks as interior feature walls for thermal mass, plantation pine framing, E-zero cabinets, all windows and doors aluminium double glazed. Sustainability features: 7.5 star minimum energy efficiency, 2.5kW solar power, heat-pump hot water service, 10,000 litre water storage, reverse cycle airconditioning to living areas, ceiling fans to bedrooms, cross flow ventilation, quality insulation, thermal mass. Other inclusions: Efficient reverse cycle Daikin airconditioning, Bosch appliances, lights, sanitary ware, automatic garage door.